The new issue of Nano Today (Volume 9, Issue 6) is out now. Click here to read the articles. For water purification, as a stressed global demand, the novel generation of nanostructured membranes has drawn extensive attentions because of their versatility and time-energy-cost efficiency. In this regard, electrospun nanofibrous membranes (ENMs) compared to their conventional counterparts are more porous and possess an interconnected porous structure. Such features give rise to extraordinary permeability thus low energy consumption. However, these membranes suffer from low mechanical stability and hydrophobicity. A combination of hydrophobic membrane materials, roughness, and a high surface area brings about notable hydrophobicity. Moreover, due to a very high porosity and surface area, ENMs especially in pressure-driven liquid separations, (such as micro-(MF) and ultrafiltration (UF), are susceptible to mechanical breakdowns [1-3]. Last, but not least, having a large pore size, ENMs can not act beyond a MF membrane [2, 4]. Hence, they are unable to discriminate hazardous pollutants of organics. State of the art research aims to address such challenges and extend the applicability of the ENMs to UF while preserving their extraordinary permeability. As a result, functionalization of the ENMs through a nanocomposite strategy could be a key solution. Inorganic nanoparticles are inherently hydrophilic and as filler can increase the hydrophilicity of the host polymer matrix. Additionally, they are able to optimize the performance of polymeric membranes in terms of antifouling, permeation, thermal and mechanical properties. The application fields of such nanocomposite membranes encompass MF, UF, gas separation, as well as pervaporation . Thanks to a number of factors (high hydrophilicity, chemical stability, antibacterial property, innocuity and low cost) TiO2 nanoparticles are one of the most used inorganic nanoparticles . Hence, adding them to polymeric electrospun nanofibers could lead to improvement of physical and chemical properties of an ENM. In terms of nanocomposite fabrication, while physical blending is handicapped in uniform dispersion of the nanoparticles within the matrix, the “sol-gel” method is able to create very fine nanoparticles with very low aggregation [7, 8]. These features are mainly due to in situ growth of inorganic nanoparticles in a limited space of polymer matrix and interaction of TiO2 with the functional groups of the polymer through hydrogen bonding. Such interactions result in more optimum thermal and mechanical properties as well. The nanocomposite ENMs show also an extraordinary wettability (a superhydrophilicity effect) . This promising feature is obtained by surface residence of hydrophilic TiO2 nanoparticles. In a mechanically stable and hydrophilic ENM, the porous structure is preserved and water with less resistance passes through the membrane . This incredibly high water permeability is reflected as low energy consumption and a long life span for the respective membrane. This nanocomposite strategy is completely successful in circumventing the conventional challenges of low wettability and mechanical stability of the ENMs . Moreover, TiO2 is able to decompose organic pollutants (e.g. dyes and pesticides) through a photocatalytic process . Accordingly, selectivity of the ENM is extended to UF. The cover image on volume 9, issue 6 of Nano Today shows TiO2/polyethersulfone (PES) nanocomposite nanofibers resembling a nano razor structure. 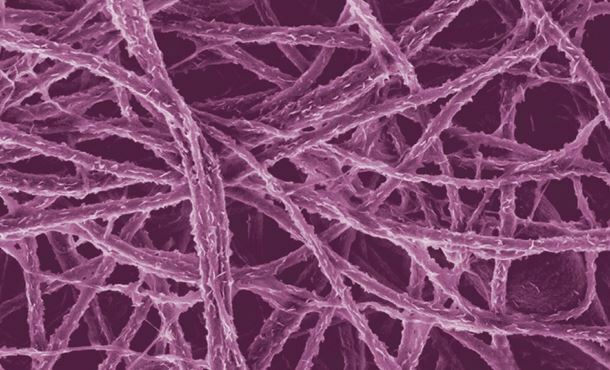 These nanofibers were produced through a compound process of electrospinning and sol-gel. At first step, a mixture of TiO2 precursor and PES solutions at the presence of an acidic catalyst was electrospun. The nanofibers containing TiO2 precursor were subsequently immersed in a hot water bath. This hydrothermal treatment was necessary to convert the precursor to nanoparticles. The sol-gel formed nanoparticles, emerging on/near to the surface of the nanofibers, are amorphous [9, 11]. But, for more optimum photocatalytic property, adsorptivity and hydrophilicity, they should be crystallized . In this regard, an annealing process at a temperature less than glass transition temperature of the polymer could be helpful and crystallizes amorphous TiO2 to anatase TiO2. The micrograph was captured using a Zeiss LEO Gemini 1550 VP Field Emission Scanning Electron Microscope (FE-SEM) at the Institute of Polymer Research, Helmholtz-Zentrum Geesthacht (HZG), Germany. The material was synthesized at the Nanochemistry and Nanoengineering Lab of the respective Institute. It resulted from an ongoing research project on photocatalytic adsorbent nanocomposite nanofibers for removal of organic pollutants from wastewater. Acknowledgments: Sh. Homaeigohar acknowledges the financial support from a Helmholtz-DAAD PhD fellowship. Also, M. Elbahri thanks the initiative and networking fund of the Helmholtz Associations for providing the financial base of the start-up of his research group. The authors would like to acknowledge Karen Prause for the SEM picture.